The summer weekend at Watkins Glen was the best bargain in racing. On Saturday, the Six Hours kicked off at noon, and on Sunday the Can-Am series and later the Formula 5000 was held. In the 1970’s, the Six Hours was part of the World Championships, joining Daytona on the schedule. As a result the best drivers were there, and many stayed around to run on Sunday. Sports Car racing is fun because various classes of cars compete. 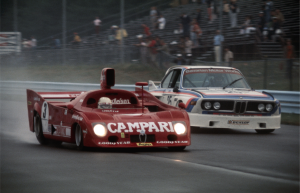 In 1975 the Alfa-Romeo 33TT12 was all conquering, winning the last 7 races of the season. Here Arturo Merzario passes the BMW of Ronnie Peterson on the front straight.